Pipers River, Tasmania Australia Bin21 £22 12%. Bread/biscuit nose and sweet citrus acidity, lemon and grapefruit with an edge of bitterness. A slight oxidative layer didn’t detract from what was a very good wine. Tamar Valley, Tasmania Australia Oz Wines, Bibendum £16.99 7.5%. A “Germanic” nose to the glass and a very sweet approach, a little too sweet-n-sour on the mid-palate and an apple finish. The style was similar to a sweet Mosel Kabinett, although the components were a little bit standalone at this stage, probably a wine that could develop over several years. Coal River Valley, Tasmania Australia All About Wine £19.99 12.5%. The nose was big and a little blowsy, oily with ripe..ripe...ripe (mango) fruit. The palate was actually quite restrained with herbal overtones, a little bitter and delicate and a clean taste, very pleasing. Coal River Valley, Tasmania Australia All About Wine £19.99 13.1%. The colour was intense, an almost fluorescent gold. It was well sulphured, with a matchstick nose overlaying tropical fruit. In the mouth it was big and syrupy with strong, edgy flavours and firm acidity. This was a well textured wine which improved in the glass, definite ageing potential. Coal River Valley, Tasmania Australia Oz Wines £44 13%. A matchstick/flint nose, sharp and fresh. There was a clean, lemony richness on the palate with delightful balance - although the acidity was maybe overly tart and a long, sweet finish. This was a taught, edgy wine...very (very) good, as to be expected for the price. Tamar Valley, Tasmania Australia Rannoch Scott Wines £13.09 13%. On the pour it looked a little older than the vintage suggested but the nose was of crunchy red fruit, quite perfumed. On the palate there was a lightly bitter, almost Quinine touch. There was a lot of cross room discussion on the taste which led to the conclusion that we had bottle variation, with the other showing dry, vegetal characteristics and some blackberry leaf – although after a while in the glass they became similar. Derwent Valley, Tasmania Australia Oz Wines £45 13.5%. A pencil shaving component to the nose but also a warmth, mellow and smoky. The strawberry fruit was sweet and ripe (overly so?) with a slight savoury edge and plenty of acid. It was an undoubtedly lovely wine, but had some people wondering about it being a cool climate Pinot. west coast bringing with them heavy rainfall. The west of the island has a wild, wet climate suited to the rainforest which covers it. 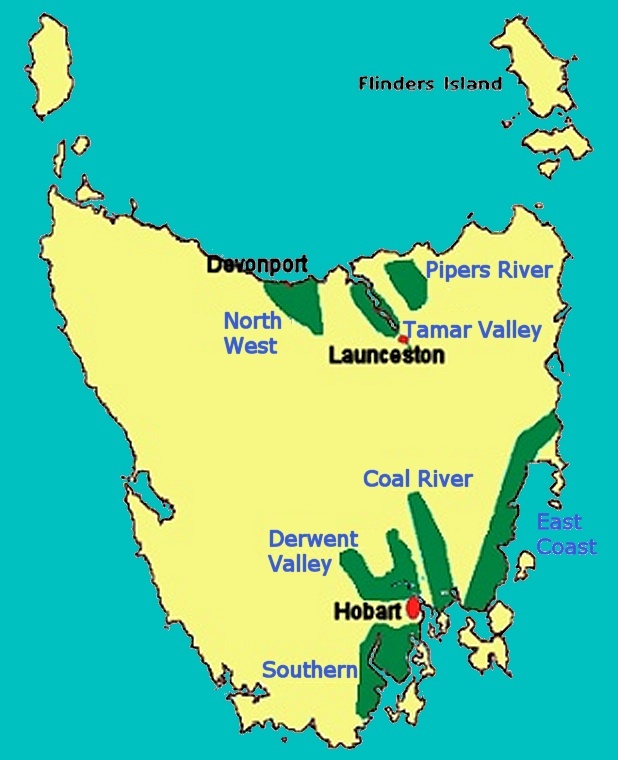 the south; and Pipers Brook, Tamar Valley, the North West and Eastern Tasmania in the north. The island has a range of microclimates and soil types which gives Tasmanian wines their diversity of character. Tasmania is the one of the oldest wine-producing region in Australia, with successful vineyards near Hobart in the early 1820s. Launceston was producing grapes in the 1830s and in East Tamar in the 1840s. Tasmanian wine was shown at a Paris exhibition in 1848 and in 1866 eight Tasmanian wines were entered in the Melbourne Inter-colonial Exhibition. The industry went into sharp decline by the end of the 19th Century and the island’s wine production all but disappeared until the 1950s.